From left to right: Executive Director of Advancement Suzanne Rothwell, Interim Provost Dr. Piyusha Singh, Robert W. Plaster School of Business Dean Dr. Shanda Davis, President Dr. Scott Dalrymple, Board Member of the Robert W. Plaster Foundation Mary Posner, Executive Director of the Robert W. Plaster Foundation Dr. Dolly Plaster Clement and Chair of the Board of Trustees Web Bixby. 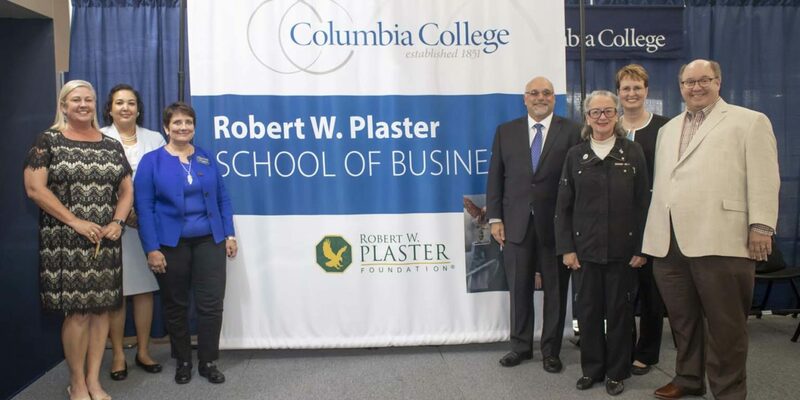 Columbia College announced today that it has received a significant, seven-figure gift to name the Robert W. Plaster School of Business. Beginning in Fall 2019, it will be housed on the first floor of the new Academic and Residence Hall that has been under construction since March of this year. The facility will also include state-of-the-art classrooms and an event space on the first floor, as well as three floors of residential living area for 150 students in response to continued enrollment growth on the main campus over the course of the last three years. The college’s business curriculum encourages students to build a solid foundation in business fundamentals that are crucial for success in today’s global economy. As a result, more than 28 percent of all degrees granted by the college last year were housed within the School of Business, making business degrees the most popular academic offerings at the college. From focuses on entrepreneurship to marketing to public relations and advertising, the programs available to students around the world are diverse and robust. 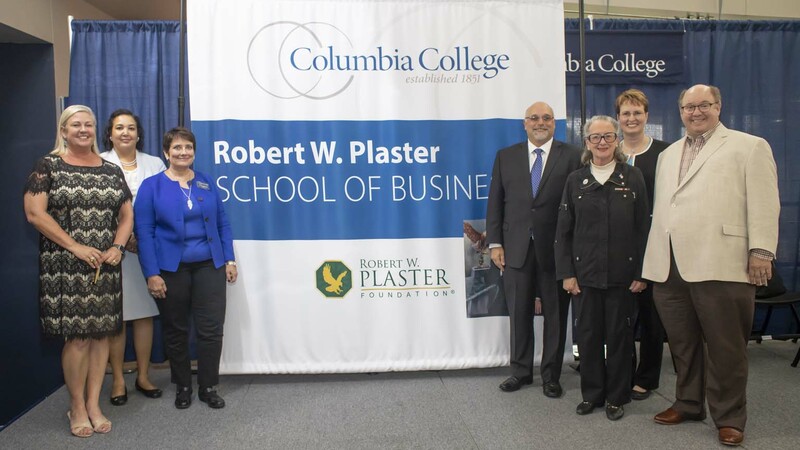 The mission of the Robert W. Plaster Foundation is to promote expanded educational opportunities, pride in America and belief in the free enterprise system for the benefit of America’s youth through named capital projects. The new structure will be located just south of the R. Marvin Owens Athletic Field on Cougar Drive. Fundraising for the building continues, with the Academic and Residence Hall set to open in August 2019. For more information or to support the building project, call (573) 875-7563 or visit my.ccis.edu/newdirection. Founded in 1851 in Columbia, Missouri, Columbia College has been helping students advance their lives through higher education for more than 165 years. As a private, nonprofit institution, the college takes pride in its small classes, experienced faculty and quality educational programs. With more than 30 locations across the country, students may enroll in day, evening or online classes. The college is accredited by the Higher Learning Commission. Columbia College educates more than 20,000 students each year and has more than 89,000 alumni worldwide. For more information, visit www.ccis.edu.